You can adjust measuring input settings separately for each measuring channel. Additionally, you can enter an individual name which is used in the whole program. 0.1 Hz for low-frequency processes. 1.0 Hz for all other processes. In principle, you can also measure all other processes for which the 1.0 Hz high pass is suitable if you selected 0.1 Hz. But a highpass filter always features a settling time after switching on or sensor connection: the lower the limit frequency, the longer the settling time. When measuring low-frequency processes, one accepts a longer settling time (e.g. 30 s). However, such a long settling time is perturbing when measuring faster processes. It can be reduced to 1/10 when selecting the 1.0 high pass. The measuring input supports piezoelectric sensors or microphones with so-called IEPE interface. A constant current supplies the sensor's integrated amplifier. Thanks to this integrated amplifier, it is possible to transfer the sensor signal over long distances (e.g. 100 m). If you connect other sensors, we recommend to switch off the IEPE supply. This way, the measuring input is a high-quality measuring input for AC voltages from +/- 10 V.
TEDS is an abbreviation for Transducer Electronic Data Sheet. The sensor not only contains an amplifier as described at IEPE supply, but also a chip with important data. For instance, this data contains type, serial number, transmission behavior, date of last calibration. To work with TEDS information, you have to activate the IEPE supply. There are few IEPE sensor types which react to TEDS detection in a way which does not conform to the standard. The result is that the IEPE supply is switched on and off. In this case you have to deactivate TEDS detection. For each measuring channel, you can enter an individual name which is suitable for the measurement task. In VibroMetra, this name is used e.g. If less than 90% of the calibration interval have elapsed, the status is OK. If more than 100% of the calibration interval have elapsed, the status is: Calibrate!!! 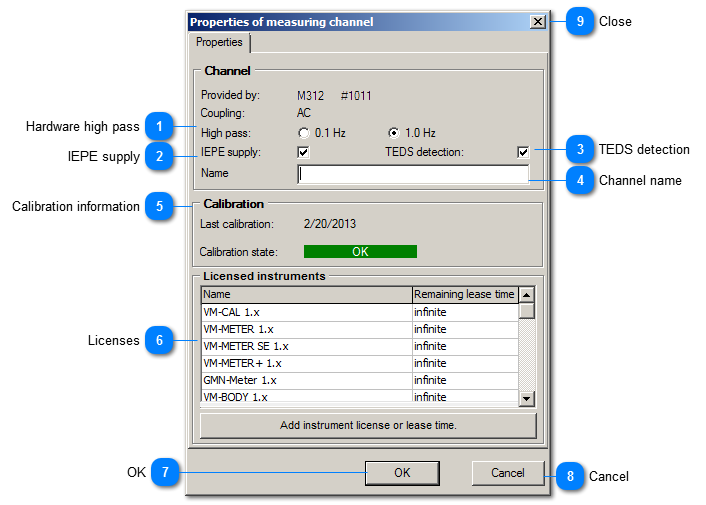 However, you can use the measuring channel independently from the calibration state. The status information is only there to remind you of the calibration and you can still use a measuring channel with an expired calibration interval in VibroMetra. 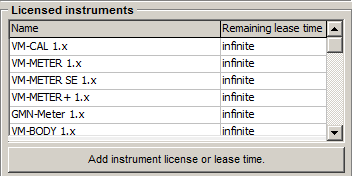 The licenses for the instruments of are saved in the USB device. This field shows the licenses for the respective measuring channel. A file window opens when adding a license. Select the key file and confirm with Open. The license will be loaded into the USB device now. This button saves the changes and closes the window. This button closes the properties window without saving changes.